The build of the pony trucks continues. 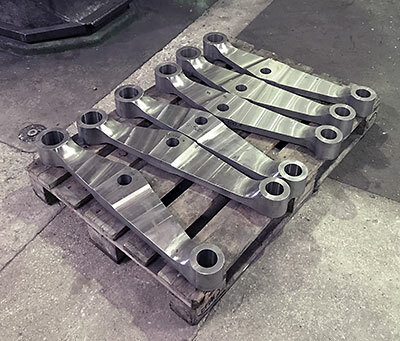 The last major casting, the front pony truck pivot slide is now at the machining stage, the axleboxes have gone to a specialist company for whitemetalling and various springs are on order. The brake block hangers are finished and the cross stretchers nearly so. 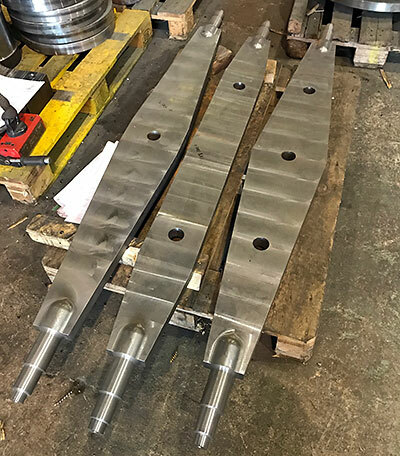 Forging of the valve spindle crossheads is in progress and in a few weeks time forging of some of the smaller valve gear components is expected to start. 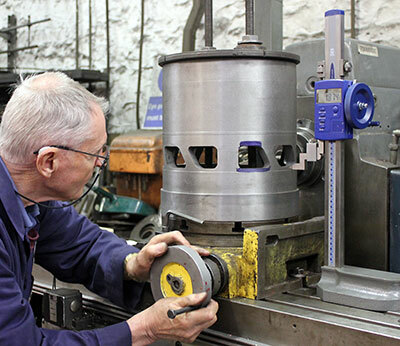 Machining of the boiler water level gauge frames is in progress. The water tanks are being painted. 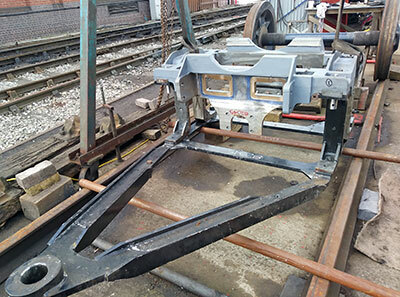 The outer sides are only receiving a temporary coat of black paint to keep rust at bay at the present time. Eventually they will be rubbed down and painted green. The Annual General Meeting falls on the SVR's Open House Weekend, and a member recently emailed me to point out that a Bridgnorth departure is timetabled to arrive at Kidderminster at 14.10. Anticipating that a number of members may wish to travel on this train, I think it might be best to start the formal part of the proceedings at 14.30 in order to allow them to get to our venue at Kidderminster Railway Museum. I hope this meets with your approval: by all means turn up for 14.00 as usual: the Museum is a pleasant venue in any case, and I will be upstairs in the Lecture Theatre and happy to engage in a general discussion "off the record" before the actual business of the AGM gets under way. I don't believe in excessively long meetings and intend that it will be over well before 16.00. I do hope to be able to welcome you on 6th April: there is plenty of good news to tell you, so let's hope for a lively afternoon's discussion. By all means bring a friend with you: all are welcome, just with the proviso that we might try to recruit non-members to the fold! "....Following these two [the GWR "Saint" and Betton Grange] should be The Unknown Warrior.....after which will be 32424 Beachy Head, 82045, 1014 County of Glamorgan, G5 1759 and P2 Prince of Wales, probably but not necessarily in that order." David goes on to praise the sophisticated marketing machines of the "Patriot" and P2 groups, but it's nice to know that our own low-key and distinctly unglamorous Riddles Class 3 tank is included in what he sees as the top handful of all the current new build projects. Front pony truck partially assembled. Photo: Peter Line. Alan Harris machining the ports in the last of the steam chest liners. Photo: Peter Line. Completed brake block hangers. Photo: Robert Stephenson. Cross stretchers just awaiting machining of slots for cotters near the ends. Photo: Robert Stephenson.